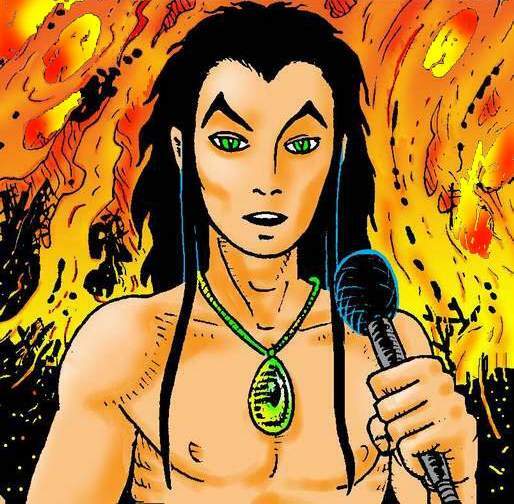 Tazio first appeared in The Prison And The Planet, one of my 3R Cosmix self-publications. I'd had his character in mind for many years--the good-guy Antichrist--but hadn't known how to present the story until realizing it was a comic book instead of a novel. The first 8 books/issues of AQ were photocopied, hand-folded and stapled in batches of 20. A humble beginning, but AQ was noticed by Michael Dowers, who published Starhead Comics in Seattle. He offered to publish AQ, and produced 2 issues containing the first 4 books. But Starhead ran out of money and that was that. However, once again it was spotted by yet another publisher wishing to carry on, Robb Horan, and AQ was first published in its entirety as a trilogy by Sirius Entertainment, Inc.
Well, that was back in 1997, since then Sirius has closed shop, although you can still find examples of their AQ books in specialty comic shops and Amazon.com. Where you can also find issues of the incomplete KA-BLAM Editions of AQ (only up to Book 7-of-20, so far), which are enhanced by color covers and NEW MATERIAL expanding the AQ mythology. But they seem to be dead-ending, however, here's an amusing link about those new editions anyway. Those new issues were products of an effort with buddy Dave Baxter,to ressurect AQ as a WEB COMIC. 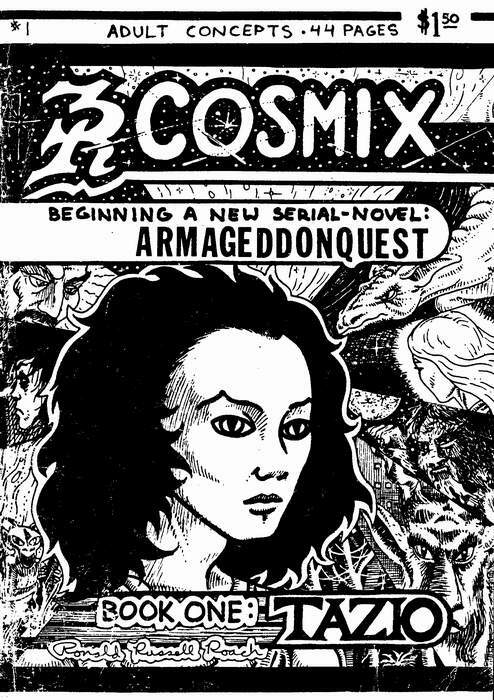 Dave offered to host armageddonquest.com, featuring a 2-page spread every day in hopes of generating a new market for AQ, but the project fizzled out after the first 7 books. So at present the only place you can tune in to AQ is right here on my own 3R Home Page. I had several reasons for not posting it myself before: for one thing it's BIG, too many megabytes of graphics to fit onto the limited website space I had; and of course, I'd still been hoping for some kind of commercial earnings. But we tried and it's not happening, so here it is for free instead because I want AQ to be available for anyone interested in reading it. This book was my passionate hobby for the 10 years it took to write & draw, without any guarantee that it would ever become published. But it was, and now here it is again as online comix. Besides, every time I put it out there someone reacts to it and gets involved. Let's shoot for AQ the Movie this time.